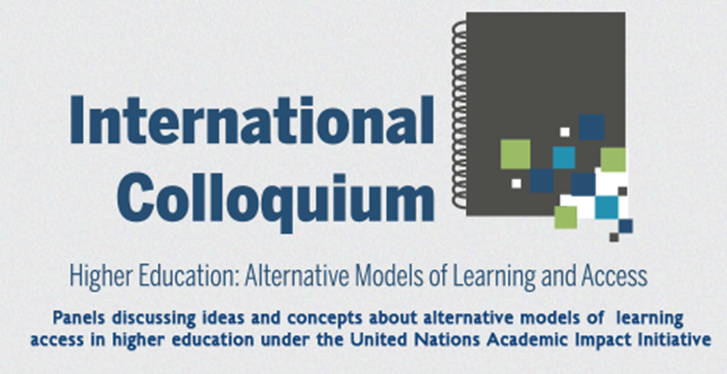 On September 19, 2013, CETYS Universidad hosted the International Colloquium ‘Higher Education: Alternative Models of Learning and Access’ and I had the opportunity of moderating its second panel ‘How to successfully swim in learning new schemes Info – skills, MOOCs, ICT and other technologies’. I dedicated some words of introduction to this interesting topic from my perspective as a librarian and as an academic and I also presented the panel’s speakers: Alison Hicks and Jesús Lau. Although my background is in Library and Information Science, I have been interested in technology and education since I graduated from my bachelor studies on Librarianship, as you may see if you read this blog. I have not been able to study or use Massive Open Online Courses (MOOCs), although they are perhaps one of the most important conceptual and technological innovations regarding alternative models of education. MOOCs are massive, imagine having hundreds or thousand of students; they are open, as they follow the philosophy of openness; and they are online, after all they are courses, online courses. MOOCs are quite interesting as an alternative model, as they may provide universal access to the university, which might have lost its way regarding its uni prefix. I see that MOOCs have plenty of opportunities and challenges for those teaching them and learning from them, some of them have to do with the competences individuals must develop to deal with them, to develop a strong discipline when it comes to study and for managing one’s own time. Information and digital literacies play a very important role when dealing with MOOCs as well as processes of academic certification and rigor, which acquire a new and perhaps more demanding dimension because MOOCs differ a great deal from classic courses. I believe MOOCs must be oriented and grounded on research and problem solving assignments, and that takes a very special academic to lead them. A special type of course needs special teachers and special students and they can be taught special competences for dealing with them. Training would involve various university departments, such as research, the academia, and the university libraries. It is interesting to point out the importance of the focus of this panel, where we have two librarians as guest speakers, Jesús Lau and Alison Hicks, as well as myself, the Learning and Information Development Librarian of CETYS Universidad, having the honor of introducing the topic in discussion and our distinguished guests. I believe that this configuration of speakers is quite a statement from CETYS’ part, because it means that libraries and librarians must be integrated as part of the engine of educational innovations. One clear path to follow is through information and digital literacies but we must question and enhance libraries’ role in breaking educational ground. You can take a look at the whole session, which was recorded. I also prepared a Spanish/English bibliography on MOOCs, higher education and skills for this Colloquium. 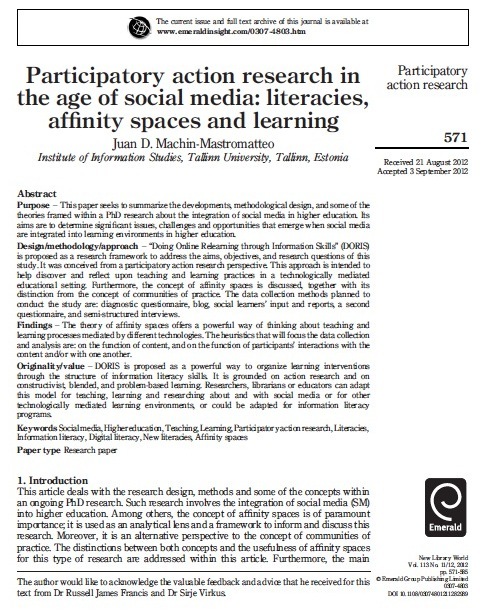 Past November I published in the journal New Library World my article titled ‘Participatory action research in the age of social media: Literacies, affinity spaces and learning’, today I’m pleased to offer everyone an open access version, courtesy of the publisher of the journal, which allows an author version to be published in a repository, so of course you may find it in E-LIS. You can find the journal article here as well. This article summarizes the developments, methodological design, and some of the theories framed within a PhD research about the integration of social media in higher education. Its aims are to determine significant issues, challenges and opportunities that emerge when social media are integrated into learning environments in higher education. ‘Doing Online Relearning through Information Skills’ (DORIS) is proposed as a research framework to address the aims, objectives, and research questions of this study. It was conceived from a Participatory Action Research perspective. This approach is intended to help discover and reflect upon teaching and learning practices in a technologically mediated educational setting. Furthermore, the concept of affinity spaces is discussed, together with its distinction from the concept of communities of practice. The data collection methods planned to conduct the study are: diagnostic questionnaire, blog, social learners’ input and reports, a second questionnaire, and semi-structured interviews. The theory of affinity spaces offers a powerful way of thinking about teaching and learning processes mediated by different technologies. The heuristics that will focus the data collection and analysis are: a) on the function of content, and b) on the function of participants’ interactions with the content and/or with one another. DORIS is proposed as a powerful way to organize learning interventions through the structure of information literacy skills. It is grounded on action research and on constructivist, blended, and problem based learning. Researchers, librarians or educators can adapt this model for teaching, learning and researching about and with social media or for other technologically mediated learning environments, or could be adapted for information literacy programs. 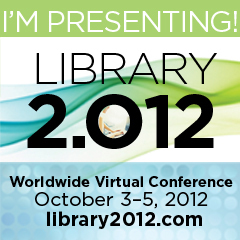 I will be presenting my doctoral research on the (free) Worldwide Virtual Conference Library 2.012. 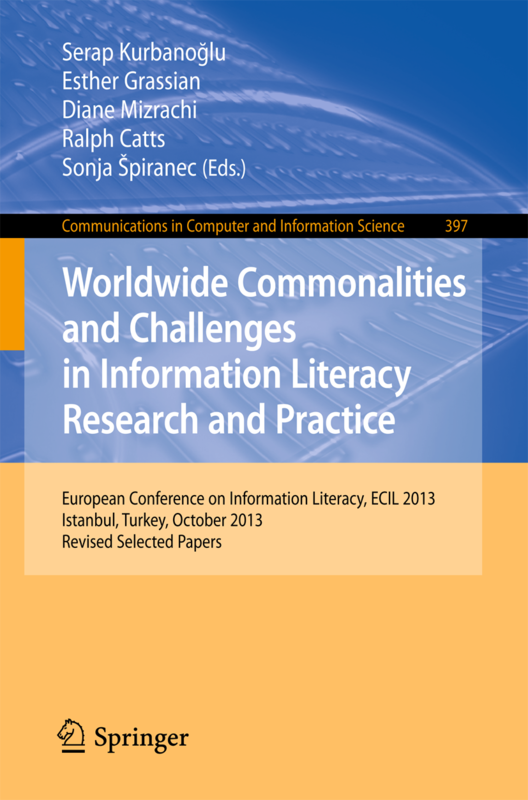 The presentation name is “Doing Online Relearning through Information Skills (DORIS): Contributions for Information Literacy Programs”. This research in a nutshell is about the integration of social media into higher education and the discovery of the roles that information, digital and new literacies play in such integration. This presentation focuses on the contributions that my research can provide to information literacy programs. You may find information about my session and the schedule of the conference according to your timezone. I offer you the slides, the link to the recording of my session, as well as the audio file. Cheers!